GM - GKOS posted a Buyable Gap-up on Friday that would also qualify as a trendline base breakout. 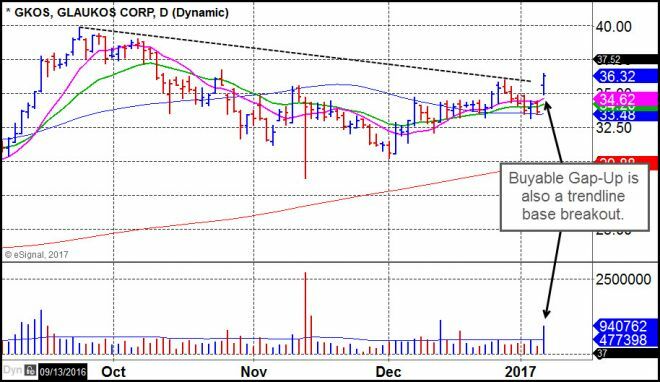 The stock has been building a base for the past three months and may be ready to move higher ahead of earnings which are not expected to be announced until early March. Dr. K - Depending on market conditions, one could use s tight stop should it move below the trendline or a more standard stop using a 2-3% undercut of Friday's low. GM & Dr. K - BOX is attempting to come up the right side of a possible double-bottom base formation. 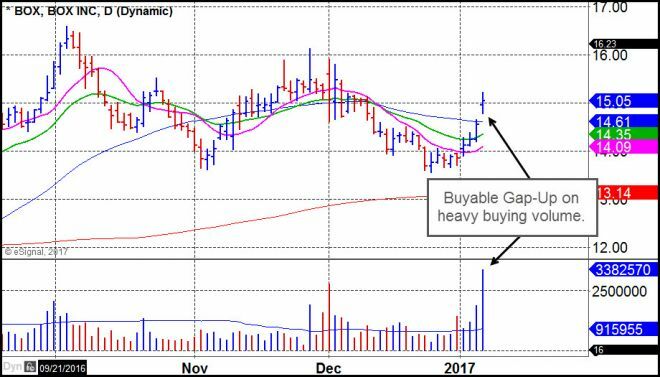 This Buyable Gap-up move came on heavy buying volume Friday, and is actionable using either the Friday intraday low at 14.78 or, alternatively, the 50-day moving average at 14.61 as selling guides. BOX is not expected to announce earnings until early March.